The northern areas of BC have much to offer adventurers from all walks of life; the Alaska Highway acts as a stepping stone to the Muskwa-Kechika (pronounced musk-quah ke-chee-kah) area of The Northern Rockies. This wilderness area is often referred to as the Serengeti of the north. A land where the boreal plains of the east meet the mountains of the west provides a diversity of habitats. This 4.4 million hectares allows plenty of room for the abundant elk, moose, stone sheep and mountain goat that roam the area. Its remoteness has enabled large predators such as grizzly bear and wolves to maintain healthy populations. This gives all the key ingredients for a healthy ecosystem with global significance. The provincial government has created a consensus based planning process that is designed to involve all stakeholders. It is hoped that this process will provide clear objectives to protect the historical and natural resources in this area. With the creation of 11 new protected areas totaling more than one million hectares and special management of the land between, the wilderness and wildlife habitat will be maintained while still allowing for environmentally sensitive resource extraction. The cultural and heritage in the area is also significant. For thousands of years First Nations have been hunting, gathering and fishing in the area. There also are many historical features in the area such as the old Hudson Bay Trading Posts, the Davie Trail (a historic wagon trail from the early 1900s) and historic voyager portage trails. The Kaska Dena refer to the area as Dena Kéyih (pronounced den-ah key-ah), which means "people's land"
Although the climate is harsh in the winter, wildlife populations are unparalleled compared to anywhere else in BC. It is estimated that there are 4,000 caribou, 15,000 elk, 22,000 moose and 7,000 stone sheep living in the area. On trips you can expect to see black and grizzly bears as well as coyotes, wolves, wolverines and cougars. If you're a birder you can expect to see sharp-tailed, ruffled and blue grouse and several species of ptarmigan. Wetlands along the river provide habitat for loons, the Canada and snow goose, trumpeter swan and a variety of ducks including mallards, blue-winged teals and buffleheads. Predator species include the northern goshawk, golden eagle, bald eagle, gyrfalcon, great horned owl and kestrels, while songbirds like the European starling; yellow-headed blackbird and several species of waxwings also live in the region. As there is little information on this area you can come and help discover new species. Remoteness has restricted development of natural resources just as it has preserved the wilderness. This also means accessing this area can be challenging. Rivers are considered the highways into the wilderness by many. Most historical explorations have used rivers. So take that heavy pack of your back, hop into a raft and follow their example. The carrying capacity and safety of today's rafts allows for safe and comfortable exploration of areas once thought inaccessible. Look for safety standards such as government-certified guides, swift water rescue, wilderness first aid and cooking skills. If you are looking for a quality ecotour make sure the company follows an environmental ethic, has guides with experience in the area and a background resource management. The alternatives are to fly into one of the local communities such as Fort Nelson, Watson Lake or Dease Lake with a commercial airline. 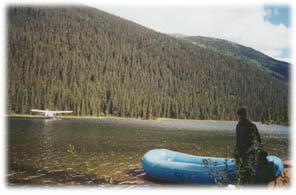 From here local operators will meet you and arrange for a floatplane to fly into this remote area. Driving the Alaska highway is also an interesting way to see the country but you must leave sufficient time as distances are great. This river is one of the favorites with rafters. It has all the qualities of a true remote expedition: untouched wilderness, a little history, and a true sense of pioneering and stunning scenery. It has the honor of being named a Canadian Heritage river due to its unique qualities and definitely lives up to this title. Starting at Boulder City, (a historic Jade mining community) the crystal clear waters flow from near the Spatsizi plateau through the Cassiar range where wildlife is as abundant as the soaring peaks above. On your journey down the river you will marvel at the amount of fish you can see in the clear waters. Enjoy fishing for bull trout up to 20lbs and grayling as big as 5lbs . . . this is an angler's dream come true. Eventually you arrive at the magnificent Turnagain falls. After a fairly grueling portage the trip continues on to the world famous Liard Hot Springs. The Gataga and Kechika are new kids on the block as far as river trips are concerned. In the heart of the Muskwa Kechika some areas have recently received protected status. 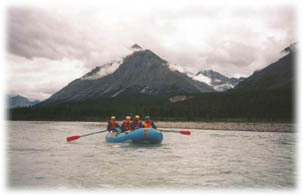 There are guided trips offered on this remote and seldom traveled river. The area surrounding the watershed offers a glimpse into what Banff and Jasper may have looked like in the 1800s. Plan a river-rafting trip and see this pristine wilderness in a raw and nature state. If a float plane ride into a game rich, remote alpine lake with nothing but time on your hands, combined with stories of an old WW II payroll plane crash sounds like interesting stuff to you look no further. We don't need to even mention the 70-year-old cabin where Hudson Bay robbers hung out with their loot. 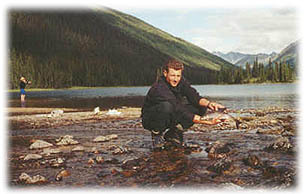 Just recently given status as a BC Provincial Park it plays a vital role to the Muskwa Kechika special management area. Although this area is still in the beginning stages of protection it still contains the wonders it has held for thousands of years. 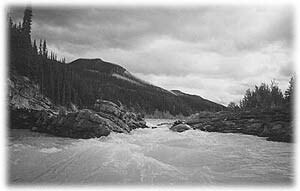 Northern BC is a remote and nature region of the province. Enjoy river-rafting at its finest with a guided and experienced company, which will take you and your party of adventurers into majestic country covered by miles and miles of forests, dotted by beautiful pristine lakes, streams and rushing rivers. Enjoy an adventure of a lifetime!